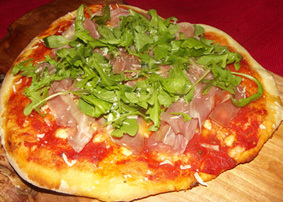 PIZZA DOUGH (for 2 – 3 portions) – Ingredients: 14 g dried yeast, 2 tsp sugar, 2 tsp salt, 2 tbsp olive oil, 300 ml warm water, 350 – 400 g strong white flour. Put the yeast, sugar and warm water in a bowl. Mix all well, cover with a clean, damp tea towel and leave to rest for 10 minutes. Then add the salt, olive oil and flour, mix all well. Turn the dough out onto a floured work surface and knead it for 5 minutes until it is smooth. Add more flour if needed. Return the dough to the bowl, cover with a tea towel and leave it to rise for about 1 hour. When ready, cut into portions. Knead briefly each portion; roll out each piece into a circle about 5 mm thick. BASIC TOMATO SAUCE – Ingredients: chopped tomatoes (we used our peeled tomatoes with basil), salt, black pepper, ½ tsp sugar, fresh basil leaves (finely chopped), oregano. 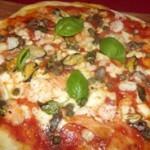 Pizza dough topped with basic tomato sauce and fresh buffalo mozzarella. Bake in preheated oven for 10 -15 minutes at about 250°C. When ready, garnish with fresh basil leaves, drizzle with olive oil and serve. Add some freshly grounded black pepper if you like. 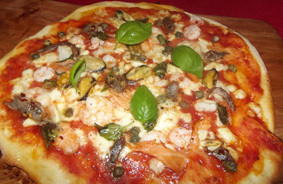 Pizza dough topped with basic tomato sauce, finely chopped garlic (added to the sauce), anchovy, mussels, squid, prawns, smoked salmon, cappers and mozzarella. Bake in preheated oven for 10 -15 minutes at about 250°C. When ready, garnish with fresh basil leaves, drizzle with olive oil and serve. Add some freshly grounded black pepper if you like. Pizza dough topped with basic tomato sauce and mozzarella. Bake in preheated oven for 10– 15 minutes at about 250°C. When ready, garnish with thinly sliced Prosciutto Crudo, fresh rocket, drizzle with olive oil and season with freshly grounded black pepper. 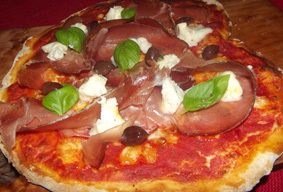 Pizza dough topped with basic tomato sauce, mozzarella and black olives. Bake in preheated oven for 10 – 15 minutes at about 250°C. When ready, add the pieces of gorgonzola and thin slices of Speck, garnish with fresh basil leaves, drizzle with olive oil and serve.